This is a reposting of an article by Lee Mathews and was posted on Download Squad. In a nutshell is shows you how to use Microsoft’s SkyDrive and its 25GB of free space to everyone, to backup or store files to an online location. If you have ever used dropbox then just think of this method as dropbox on steroids. Live SkyDrive is an awesome service. 25GB of web storage for free? Yeah, that sounds good to me. Sure, the 50MB per file limit is a little bit of a downside but it’s still a great place to store documents, music, and photos. Heck, if you tell an app like 7zip to chunk big files up into 50MB pieces you can store whatever the heck you want. If only there was a way to access your SkyDrive storage like a local hard drive without an app like Gladinet or SD Explorer…Why, that’d make it like a free Dropbox account x 12.5! As it turns out, there is a way to do that — and it’s pretty darn easy to do now that Office 2010 is here. That’s about it. Let’s go! Fire up PowerPoint and create a new blank presentation (file -> new). 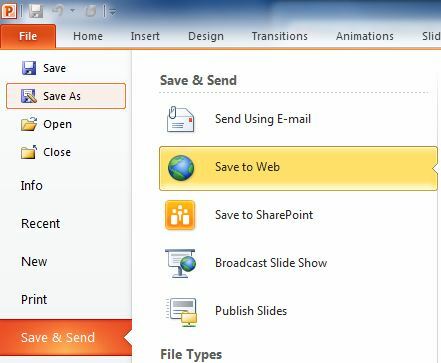 Next, head back to the file menu and click save & send then choose save to web from the submenu. It’s all downhill from here. Click at the end of the line (after Documents, for example) to highlight the path. Copy it to the clipboard. Now right-click Computer on your start menu and choose map network drive. Select a drive letter, paste in the path, and choose to reconnect the drive. 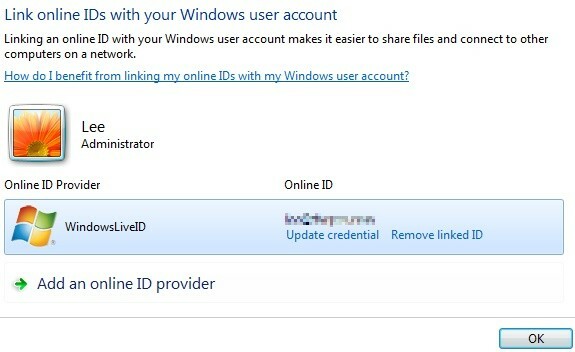 For reconnection to work, you need to have the Windows 7 online ID provider for Windows Live installed and your ID linked to your Windows login. Now just click OK, and you’re done! If everything went well, a new Explorer window (like the one at the top of this article) will appear with the contents of the folder you mapped. You’ll have to repeat the process if you want access to multiple folders — just save & send again and pick a different location! 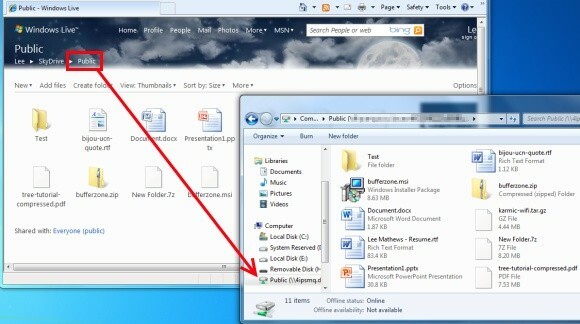 Drag and drop files to SkyDrive…sync from your desktop to the cloud with SyncToy, you name it! Hopefully your upload speeds are a little better than mine, because 30KB/s just doesn’t cut it.